Schedule 13D - What Does It Mean? What is a "Schedule 13d"? In which situations would an investor (or money management firm) be required to file a Schedule 13d? A Schedule 13d is also referred to as a "Beneficial Ownership report". According to the SEC, the filing of a Schedule 13d becomes necessary when "a person or group of persons acquires beneficial ownership of more than 5% of a voting class of a company’s equity securities registered under Section 12 of the Securities Exchange Act of 1934". A Schedule 13D needs to be filed and made public within 10 days of the purchase. 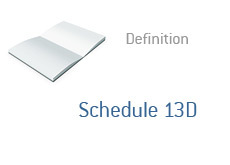 Why is a Schedule 13D necessary? A Schedule 13D alerts shareholders in a company as to which individual investors or companies may be preparing to launch a takeover. For instance, if Carl Icahn files a Schedule 13D that announces that he has taken a 15% stake in a company, then investors will likely come to the conclusion that their company is "in play". The Schedule 13D is intended to prevent investors or companies from "sneaking up" on companies and quietly accumulating very large positions.